Come one, come all! The Carniepunk Midway promises you every thrill and chill a traveling carnival can provide. But fear not! Urban fantasy’s biggest stars are here to guide you through this strange and dangerous world. 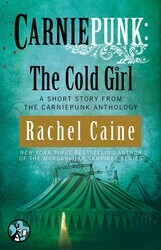 . .
RACHEL CAINE’s vampires aren’t child’s play when a naïve teen discovers that her heart has led her far, far astray in The Cold Girl. With Parlor Tricks, JENNIFER ESTEP pits the Gin Blanco, the Elemental Assassin, against the Wheel of Death, and the general creepiness of clowns. SEANAN MCGUIRE narrates a poignant, ethereal tale of a carnival returning to a dangerous town twenty years after its first appearance in Daughter of the Midway, the Mermaid, and the Open, Lonely Sea. 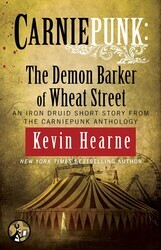 KEVIN HEARNE’s Iron Druid and his wisecracking Irish wolfhound discover in The Demon Barker of Wheat Street that the impossibly wholesome sounding Kansas Wheat Festival is actually not a healthy place to hang out. With an eerie, unpredictable twist ROB THURMAN reveals the fate of a psychopath stalking two young carnies in Painted Love. 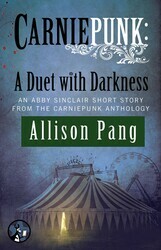 Plus nine more tales from the fantastical pens of Delilah S. Dawson, Kelly Gay, Mark Henry, Hillary Jacques, Jackie Kessler, Kelly Meding, Allison Pang, Nicole Peeler, and Jaye Wells. Visit the official Carniepunk website to discover the dark and mysterious Carniepunk Midway. Check back often as more attractions will go “live” as stories are added! It took me two days to die. On the first night, I met Madame Laida, and on the second night, I met the Cold Girl. This is me. I’m Kiley. I’m sixteen, and I have good taste in clothes and mostly crap taste in boys; I’m kinda pretty, I guess, but that never mattered really, because I’ve been in love since I was about eight with Jamie Pierson. Oh, Jamie’s pretty, too, in that boy kind of way: glossy black hair, really blue eyes, perfect skin. When he first smiled at me, I fell head over heels in love. It took me about two years to convince him to even hold hands with me, but by twelve we were kissing, and by fourteen we were officially In Love, with all the doves and bells ringing and sparkles from heaven. Cue the music, bring up the credits, the story’s over and we all live happily ever after. Or at least, I thought that was the story. I mean, not that my friends didn’t try to tell me. Marina, she was my best friend until I was fifteen, but we had a blowup slap fight about Jamie and how he was treating me. I thought she just didn’t understand him. I thought she was a liar when she said he was a douchebag. By then, Marina was my last friend; everybody else had already shrugged, moved on, figured me for a lost cause. Smithfield isn’t exactly a metropolis; it’s stuck in the middle of nowhere, and any kind of diversions are welcome. 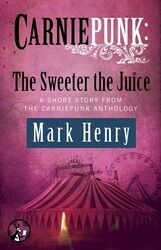 Still, the arrival of a creaky, ancient carnival was something new. I’d thought Smithfield had long been scratched off all the traveling show lists, but this one looked to be just barely surviving anyway. Even the flyers for it posted around town looked old, not just in design, but even the paper they were printed on. Still, some of us didn’t care about quality; when word went around school that day that a carnival was setting up outside of town, the quality of the entertainment was the last thing on our minds. We just wanted a good time: some cotton candy, some rides, some screams, some cheesy fun. At least, I did. And I texted Jamie instantly from my last class of the day. CRNVL 2NITE? And Jamie texted back thirty seconds later: Y. So. It was a date. I called my mom to tell her that I wouldn’t be home until late because I was going to the movies with Marina. (She never checked; she just assumed that once a friend, always a friend, and I was careful to never use Marina for anything that would bring up awkward parental phone calls.) Mom didn’t worry. You didn’t much in Smithfield. Little town, comfortable, boring, nothing ever going on here, right? Why do you care if your sixteen-year-old goes to the movies with a friend? But I’m here to tell you . . . maybe you should.